The green line shows our approximate itinerary for the 7-day, 250-mile bike trip. Biking in Europe had always been a childhood dream, and only at an older age have I been able to live this dream. It takes time, money, and planning, but most of all, it just means making the decision. As Nike advertises – “Just do it.” In the two previous years I had biked in eastern England and in the Netherlands and Belgium. This year I had a July meeting in Dublin for my first visit to Ireland, and I decided a year in advance that I would bike somewhere in that country in 2001. The previous year when I had returned from a bike trip through Holland and Belgium to join a professional meeting in Amsterdam, the leader of that meeting, Len Kleinrock, had said that he’d like to join me the following year for Ireland. He wasn’t a biker, and I had doubts at the time whether or not he was serious, but I welcomed his interest. He is someone whom I have known professionally and personally for many years. He teaches at UCLA, has written some well-known textbooks, and is one of the four people credited with the invention of the Internet – for which he has received numerous prestigious awards. One thing that we have in common is that each of us has been a recipient of the International Marconi Prize. Soon after, Len’s wife, Stella, bought him an expensive bike, and he began to cycle near his home in Los Angeles. As time went by, we corresponded regularly via email in planning to trip to come. I decided that the best part of Ireland, the part where most tourists went, was the southwest, and I laid out an itinerary with the help of the Michelin and Ordnance Survey “Holiday” maps. In laying out the trip I kept the trips relatively shorter than in previous trips -- about 35 miles a day, as opposed to 43 – partly because of Len’s inexperience, and partly to give more of an opportunity for sightseeing. Little did I know at the time that Len would do better than I on the hills that were to come in that innocuous-looking itinerary! Having decided on the region and the length of segments, the rest of the itinerary was determined by the logistics. I had learned the previous year in Holland that biking constantly into a headwind is not fun, so this year I checked the prevailing winds for Ireland, which are from the southwest, and consequently planned a northward journey. The decision on whether to rent bikes or bring our own was a pivotal one. Previously I had always taken my bike with me on the plane. It’s always nice to have your own familiar bike in a foreign country, but sometimes the logistics are formidable. In Ireland there is a special incentive to rent, because it seems to be the only country where there is a rental system in which it is possible to rent in one city and drop off in another. Given that incentive, together with the difficulty in transporting my own bike from Dublin Airport to Dublin for a meeting, and then to the southwest, and then back, I decided reluctantly to rent bikes. That decided, there were only a few cities where such rental and return was possible. Going from south to north in western Ireland, the choice was made for me – we would rent in Cork and return in Galway. Len and I agreed on 7 days of biking, which was a compromise based on other constraints that each of us had. I picked the nightly stopping points at about the right distances along the route, which starting from Cork were Macroom, Killarney, Tralee, Ballybunion, Milltown-Malbay, Ballyvaughan, and Galway. These were the towns along the way most favored by tourists, but in truth they were about the only towns along the route where you could easily make reservations from abroad. Len volunteered to make reservations, and using the Internet and a Michelin guide, he quickly nailed down our accommodations everywhere except at Milltown. Instead, he got hotel rooms in Lehinch, which was about 8 miles further to the north. I handled the bike reservations using the Raleigh website in Ireland. I didn’t hear back from my inquiry for about a week, and then I was referred to a particular bike shop in Cork. Subsequently, I exchanged email messages with an Aidan Quindlan in that shop, and made reservations for 2 bikes to be returned in Galway. 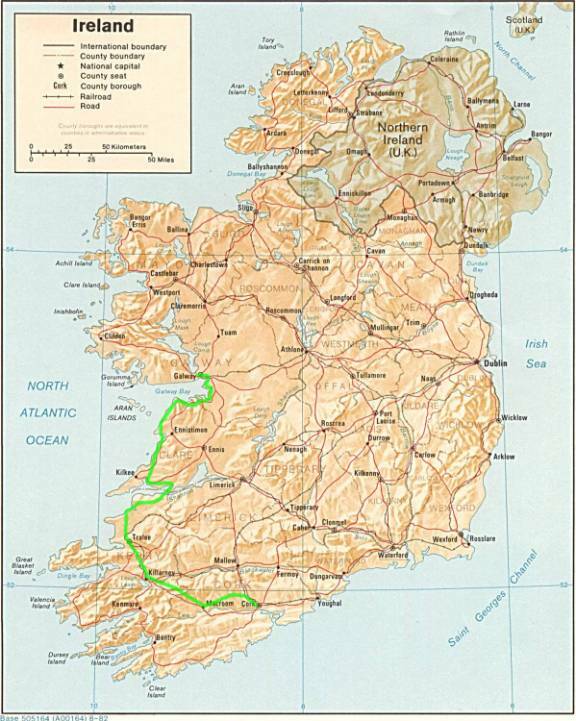 As you can see from the shading on the relief map above, there are many hills and mountains in Ireland. It’s not as if they are like the Alps, but they were a concern for me, since I almost always bike in the flatlands of coastal New Jersey. I was also intimidated by reading the book “Round Ireland in Low Gear” by Eric Newby. Mostly I found this book quite boring, as it had so much detail related to the arcane and convoluted history of Ireland, but the thing that most impressed me about his biking was the constant need to climb long hills to wherever he was going. In order to understand the hills on the planned itinerary, I needed detailed maps with topological information. 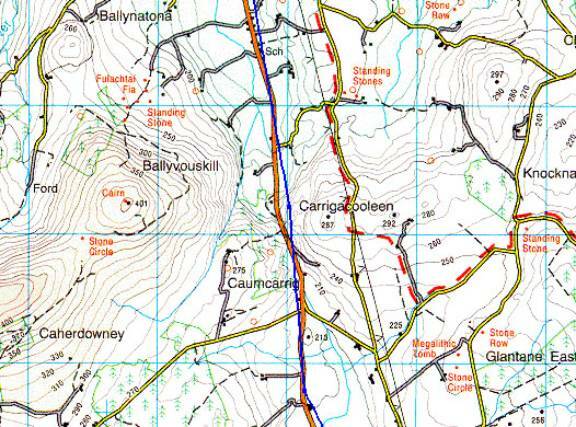 Fortunately, such maps are available for all of Ireland from the Ordnance Survey Mapping Agency in the UK. These are wonderful maps, as I had learned in my previous bike trip to East Anglia. In fact, on the back cover of Bill Bryson’s immensely popular book, “Notes from a Small Island”, is reprinted a paragraph from the text listing the three greatest things about England. I forget what two of them were, but the third was the existence of the Ordnance Survey maps. These maps are so detailed that they not only show elevation gradients, but even individual houses, phone booths, and ancient artifacts, among other things. The problem is that it is hard to find these maps in the United States. I had found a small store on the seventh floor of a building in Manhattan that carried all of the maps for England, but I couldn’t find any place that stocked the maps for Ireland. Previously I had even tried to order maps from a national service dealer on the Internet, but I never even heard back about my order. I also visited a map store in Washington, D.C. that was listed on the Ordnance Survey web site as stocking their maps, but their collection contained only the larger scale “Holiday” maps for Ireland. I had temporarily forgotten about my need for these Ordnance Survey maps when in February I was walking down Charing Cross Lane in London passing by one of my favorite bookstores, Foyle’s. It suddenly popped into my head – of course, they would have all of these maps. The English believe in maps. Not only did Foyle’s have all of the Ireland maps, but I later discovered a map store near Covent Garden that had three large floors of maps even for countries that I that didn’t know existed. Now this was a map store! In that store Ireland was so mundane that it rated only a dusty corner of the basement. But they also carried all of the Irish Ordnance Survey maps. Faced with the bonanza of all of these maps, I had a difficult decision to make – one that I have since had occasion to rethink. The problem is that it takes 89 of these maps to cover Ireland. Each map contains only about a 20-mile square, so it would take more than a dozen to encompass my proposed itinerary. Each map cost about $10, and more importantly would take valuable space and weight in my panniers. In the end I decided to buy five maps that covered about 75% of the trip. In order to cover the other 25% I would have had to buy about six more maps, each covering only some small part of the remaining itinerary. It was a compromise, and my past experience had been that whenever I got lost, it was in one of those little areas where I didn’t have the detailed map. Nonetheless, I didn’t buy them all, and as I will relate later, not having those remaining maps made an impact on my subsequent bike trip. Shown above is an example portion from one of the maps I bought. The blue line shows my proposed route through this section. The scale is such that each square on this map is one kilometer (about 0.6 miles). At a normal riding speed on a bike I would cross one of these squares in about three to four minutes. Notice the information about the positions of stone circles, megalithic tombs, and standing stones. Most importantly, however, notice the elevation contours, which are lines of constant elevation spaced at 10-meter intervals. Whenever I would cross one of these contour lines, I would be going up or down by about 33 feet. The worst thing would be to bike perpendicular to a lot of those lines where they are close together. You can see that this section of County Cork, between Cork City and Killarney, is relatively mountainous, and that the proposed route threads delicately among the hills. I did some comparison with hills that were near my home in New Jersey. I knew how relatively hard they were to bike, but I didn’t know their gradients, as I did for the hills that I had never seen in Ireland. Then I was able to get the Delorme software of topological maps of the United States, and on my computer I could trace out routes on streets where I live and see their changing elevation. I found that a guideline for my experience was that I could continuously cross three of those ten-meter gradients within a one-kilometer square. More would be a problem. As it turned out subsequently, more it was. In choosing the route I tried to pay attention to the gradients so as to avoid hills. However, as I later discovered, I didn’t pay enough attention. You can see in this example that the gradients are very close together and the question is how many and how often the route crosses these elevation lines. Without a magnifying glass and a lot of study, it’s hard to tell. In the actuality I found that it was more reliable to look at the specific elevations noted on the map (for example, the “213” meter height near the bottom of the blue line) and to see how much that changed by the next such point. But I didn’t realize that until I was on my bike puffing my way up unexpectedly difficult hills. There was another difficulty in interpretation of the Ordnance Survey Maps. Which roads were friendly to bikes, and which not? I had no idea. In this example the yellow roads are “secondary roads”, and I supposed that these were narrow roads without much traffic. The red road, however, was a “main” road. I assumed that here we would find considerable traffic, and perhaps there wouldn’t be a shoulder for bikes. Maybe we had to avoid such roads. It isn’t shown here, but there also were dotted-green and green roads, and I supposed that these highways absolutely had to be avoided. I wish that they made maps specifically for bikers with traffic, width, and safety information, but I have never seen such a thing. My navigation in my two previous European trips had left something to be desired. On a number of occasions I had gotten lost. Getting lost in a car is no big deal – you just keep driving until you discover where you are. But on a bike it had cost me ten miles of riding a couple of times, and that is no small thing. On both trips I had taken my handheld GPS, but it had been pretty worthless for several reasons. First, I hadn’t learned to use it well – specifically to set up the custom display in a useful format. Second, I did not have a bike mount for the GPS, so I carried it inconveniently in my fanny pack. Moreover, since the thing eats batteries, I only turned it on every now and then. Finally, although I had programmed the coordinates of destination cities, the GPS knew nothing of the route between the cities. Overall, it had been pretty worthless. For Ireland I intended to make the GPS useful. This wasn’t so much a necessity, given good maps, but it was mostly for techie fun. I discovered that Magellan had just marketed a bike mount for the model 315 that I had, and so I ordered that. At the same time I ordered a computer connector and mapping software (by Fugawi) that would allow me to upload and download information between my PC and the GPS. Then I experimented with the GPS on my bike in New Jersey and, after having had the thing for two years, I finally learned how to use it well. In fact, it did a lot of things that I had not realized, and one especially important feature was that it could display Irish grid coordinates. Those are the coordinates in Ireland given on the Ordnance Survey Maps instead of latitude and longitude, and which measure directly kilometers of distance. So using the GPS coordinates and my maps, for example, I could walk directly up to one of those marked standing stones and be within feet of it just using the GPS display information. The Fugawi software allowed me to scan the Ordnance Survey maps, calibrate the computer with three coordinate positions on each map, and then to draw routes and mark landmarks that could be uploaded to the GPS. So, for example, the blue line in the picture above was drawn on my computer screen and uploaded into the GPS. When I got to Ireland the GPS would show me exactly where I was in relation to that designated path. How could I go wrong? Later I made a very small discovery that made a great deal of difference in my attitude towards the GPS. The fact that the thing ate batteries really got into my mind, and I was always afraid to leave it on. Typically, it would exhaust its two AA batteries in only a few hours of cycling. I calculated that I would need several dozen batteries for the trip in Ireland. I had been watching the battery websites to see if anyone had begun making lithium AA batteries, which would last a lot longer. One day I saw that Energizer was starting to market lithium AA batteries that lasted up to five times as long as alkaline batteries, and weighed only half as much. Just what I needed! Moreover, these same lithium batteries could be used for my digital camera, an Olympus C-3000 that also loved to eat batteries. I bought some lithium cells and used the GPS on my bike in New Jersey for several weeks. I clocked over a hundred miles and the GPS said the batteries were still fully charged. What a difference! Now I could forget about the battery drain and leave the GPS on constantly. Not only would it show me exactly where I was and the route to be taken, but it would also give me speed, altitude, odometer, compass, time, and even times for sunrise and sunset and phase of the moon if you cared. Neat gadget! The odometer functions were especially important to me psychologically, because with a rental bike I would not have my usual bike odometer and I would “lose” the miles that I had biked. I have a compulsion to bike so many miles a year, and I have this compelling need to know where I stand relative to that goal. Each year previously I had learned something about how not to pack. On the one hand, I had to be prepared for every kind of weather and contingency – rain, heat, cold, repairs, medicines, etc. On the other hand, every pound carried was a pound that had to be lugged up hills. In Holland that hadn’t been a problem, since in a flat country weight wasn’t so important as was the relative wind resistance. Volume was also a consideration. My own panniers held 2400 cubic inches of content, and I used that as a guideline. Roughly, that would be a small suitcase – something like 12 inches by 20 inches by 10 inches. By email Len and I discussed the packing situation. We weren’t sure that whatever panniers we had would fit the rental bikes, and so we decided to rent panniers to go with the bikes. In planning we used the 2400 cubic inch guideline, and it was only a day or so before we left that I discovered from the rental website in Ireland that the rented panniers would hold a monstrous 3600 cubic inches. That would be, of course, only so much more weight, so it was pretty irrelevant information at that time. In retrospect, as in previous years, I took too much. My pack weighed in at about 25 pounds. I think I could have cut it back by a third. I took two biking outfits, rain gear, long biking pants, one pair of “evening” pants and several shirts, a sweater, sweatshirt, toiletries, guidebook, reading book, maps, tools, underwear, socks, and miscellaneous things. In addition to the panniers to be rented Len and I both bought handlebar bags to mount on the rented bikes. These handlebar bags would also serve as map-holders, and would conveniently carry guidebooks and tools at the ready. We took fanny packs to keep valuables – wallet, passport, and camera – on our persons at all times, whether or not we were on the bikes. There was always the issue of whether we would leave the panniers on the bikes when they were parked and locked. In fact, it was so inconvenient to remove and restore the panniers that there wasn’t much choice. The only option was not to have anything very valuable stored in the panniers. Another issue was whether to carry or wash. In the cool rainy climate of Ireland things wouldn’t dry very well overnight. My biggest problem was socks. They used up a lot of space – particularly the white wool biking socks. Len made a very useful suggestion of getting thin cotton socks, which would not only take less space but would dry much more quickly, and this turned out very well. I took four pairs, and did several overnight washings. I also had to count on overnight washings of my primary biking outfits. One of the controversial items was a guidebook for Ireland. The problem is that these things are heavy. I had several that were good – the Lonely Planet guide and the Rough guide. They’re both heavy. In both England and Holland I had decided that guidebooks weren’t worth the weight, and I had copied only the relevant pages and had carried them loose. Then in trying to use these loose pages I could never find what I wanted. So for Ireland I decided to take the Rough guidebook, while Len took the Lonely Planet guidebook. In retrospect neither taking the book or not taking it seems best. The problem is that in the 700 pages or so of the guidebook there are only about 25 that are relevant to the trip. The rest are a heavy waste. Another small, vexing issue was how to carry my gear before and after putting it in the bike panniers. I obviously couldn’t take a suitcase, since what would I do with it? The ideal solution would have been a duffle bag made of thin silk or some such material that would weigh almost nothing and take almost no space in my panniers. It wouldn’t have to be durable since it only had to last a couple of days before and after the biking portion of the trip. After several visits to different travel and luggage stores I gave up trying to find such a thing. I guess there’s no profit in cheap, light throwaway bags. Instead I decided to use a heavier duffle bag that had been a gift at some conference years before. Not only was it heavier than I’d have liked, but it didn’t fold very well. I figured I could fold it just well enough to use bungie cords to attach it on top of the back rack of the bike. If that didn’t work, I was prepared to throw it away in Cork and buy a new bag in Galway. There was one portion of our email about packing that really struck me as funny. Len wrote that he was considering taking a telescoping pointer to fend off dogs that might chase us. I had this fantasy where Len would extend the pointer and parry at the dog like some kind of fencer. I also imagined that this would piss off the dog no end, and that he might decide to take it out on me. As it turned out, Len didn’t take the pointer, but he did take pepper spray. He never used it, though. So much for the preparations. They took many months of email discussion and served as a nice way of dreaming and learning about the forthcoming trip. By and large, the preparations and logistics worked well, but as always I did have a few lessons learned. Principally, I needed to have had all of the relevant maps and to have studied them more closely. Also, and once again, I took too many things. The sweatshirt, for example, was a bad idea. It just got soaked with perspiration every day. And I never wore the long-legged bike pants, which were redundant with my rain pants, which in turn were a cheap design that was unnecessarily heavy.